Experience the bird’s eye view of the hypnotizing surround, while you get to explore through and redefine adventure out on a para-sailing spree in Tarkarli. Soar over the waves of the sea and the entire coastal region and experience a never before enjoyment, surrendering yourself to the ultimate and amazing water sports. Feel just like a bird, fly high, up in the sky and get delighted to the engrossing and truly terrific adventure sports in the country. Tarkarli Scuba offers some of the most daring, electrifying and tasteful water sport activities that would certainly fill your heart with true adventure, unmatched cordiality and some of the most looming escapade. 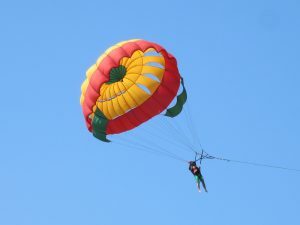 Rise and descent in the amazing parasailing adventure out here, wherein the equipment used is of high quality, observed and researched well and apt for keeping the risk factor and safety features to guide you through all in place.